The area known today as Camp Connell was first used by Native Americans hundreds of years ago. Its location on San Antonio Creek was along a trading route between bands of MiWuk, Piute, and Washoe, and was a popular summer encampment. By the mid-1850s, the old Indian trail had been improved to accommodate increasing numbers of miners and adventurers heading west to the Calaveras goldfields, as well as visitors flocking to the area to view the recently discovered giant sequoia. Jack and Noreen Connell, who had purchased the Dorrington Hotel property in the mid-1920s, established Camp Connell in 1928. 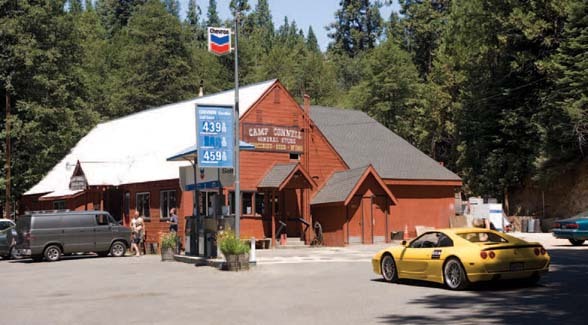 With auto traffic increasing and the old hotel in need of repair, the couple decided to build the Camp Connell Store, complete with gasoline station (still operating today as one of the oldest Chevron stations in California), general merchandise store, rental cabins, and a campground. Camp Connell quickly became a stopping place for travelers along the Ebbetts Pass Highway, as well as a gathering place for local residents and cattlemen. The Connell’s continued to expand the store and added a café to serve the increasing number of visitors. By 1934 the post office was moved to the store from Dorrington and became “Camp Connell Station.” The store served as a community center where local residents and vacationers alike would come to share news and leave messages, much as it does today. Occasionally, Circuit Court was convened in the building. The campground was closed in 1949, while the cabins remained a part of Camp Connell until the 1960s, when the highway was realigned to accommodate the ski resort and village at Bear Valley, as well as the development of Big Trees Village subdivision. Portions of the old highway remain on the store property, as its two access points.